With the automotive sales zooming, the aftermarket sector is witnessing a boom. The Indian automotive aftermarket , which has grown at a compounded annual growth rate (CAGR) of 14 per cent in the last five years, is estimated to grow at Rs 75,000 crore by the fiscal year 2020, stated a CII report. According to Ashok Belani, Group President & Managing Director, Valeo – India, the Indian automotive industry mainly produces small models, but the market is increasingly looking to new technologies to cut high pollution levels and curb the very large number of road accidents. This shift offers an opportunity for Valeo, whose approach to designing cost competitive products featuring high-tech functions promotes cleaner, safer, mobility. 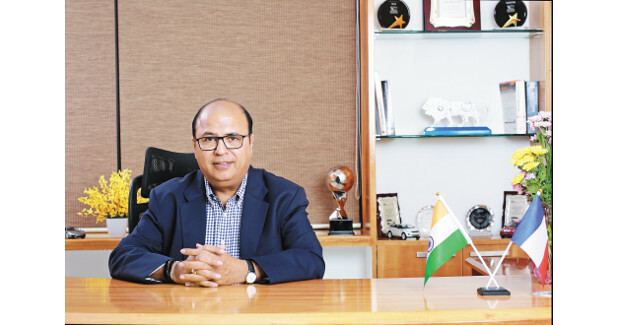 In this interaction with Rakesh Rao, Ashok Belani tracks the changes in automotive aftermarket and how his company plans to tap these opportunities. How is Valeo Service serving the auto aftermarket sector in India? Valeo supplies original equipment spares (OES) to automakers and replacement parts to the independent aftermarket (IAM). With a worldwide presence in all aftermarket channels, Valeo offers a broad range of car parts, automotive products and services that support aftermarket professionals and enhance safety; comfort to deliver a unique driving experience. Valeo also provides diagnostics, training, as well as sales and marketing support to car dealers, spare parts distributors and independent garages worldwide. In addition to serving our customers in India, Valeo also serves customers in Sri Lanka, Bangladesh and Nepal. What is driving the demand for Valeo Service products in India? Valeo is present in the original equipment (OE) and the aftermarket segment in India. In India, the Valeo aftermarket product portfolio comprises mostly of transmission and electrical products. A strong distribution network of 435 ‘Generalist’ and ‘Specialist’ for sales and service across the country has been established, covering tier 1 and tier 2 cities. Valeo partners with well known distributors, for their quality and timely service. Through these efficient networks, Valeo ensures that the products are always available at the right place and right time. How do you analyse the performance of Indian auto aftermarket sector? The auto industry in India has been witnessing massive growth in the last few years. Valeo works with all the international automakers operating in India. The Indian automotive industry mainly produces small models, but the market is increasingly looking to new technologies to cut high pollution levels and curb the very large number of road accidents. This shift offers an opportunity for Valeo, whose approach to designing cost competitive products featuring high-tech functions promotes cleaner, safer, mobility. Valeo also holds a large share of India’s clutch and electrical system markets, and its i-StARS Stop-Start system has been selected by a major local automaker. Automotive industry is witnessing lots of changes such as shift to BS VI emission norms, adoption of stringent safety regulations, move towards electromobility, etc. How these transformations will change the dynamics of aftermarket business? Valeo is at the epicenter of 3 simultane-ous revolutions of the automotive industry: autonomous driving, electrification and digital mobility. The impending shift in the auto sector in the country, such as electrification of vehicles and stringent implementation of safety norms, is expected to increase the acceptance among customers for high quality products, such as those offered by Valeo. Valeo will benefit immensely with an already strong product portfolio that addresses these emerging trends. One of Valeo’s overall objectives is to reduce the environmental impact of cars. Part of is this objective is expressed through its commitment to the circular economy. For example, Valeo refurbishes alternators that have already had a first life. One thousand two hundred different alternator products can be reconditioned in this way, representing coverage of more than 90 per cent of cars on the road in Europe for example. Valeo’s range of remanufactured products is expected grow by an additional 10 per cent over the coming months. Could you please elaborate on some of the emerging trends in auto aftermarket sector? And how is your company tapping these trends? The mission of Valeo is to be a trustworthy partner, supporting distributors and workshops in their daily professional activities. The automotive aftermarket is evolving fast, with increasingly complex cars, which may be painful for mechanics. Valeo highly focuses on delivering a permanent assistance to its customers, inform, advise in the workshops or help technicians on site. Valeo deploys a team of 20 technical promoters in India. Their mission is to support with more complex technologies, new regulations, warranty issues, to visit each and every customer for coaching, advising or training. Overall their goal is to provide the best on-field assistance. Moreover, the Group is assisting vehicle repair professionals with the launch of three new technical and digital services. How are they special? They were designed for and in collaboration with retailers and mechanics. Valeo will implement in the coming months innovative digital information and training tools for front-line operators. Together, these tools make up a new kind of connected assistance. Following interviews conducted with 600 retailers and mechanics in seven countries (Brazil, China, France, Germany, India, Spain and the UK), Valeo is announcing the launch of Valeo Tech @ssist, offering all Valeo technical information just two clicks away. What will be your focus at ACMA Automechanika 2019? This is the second year that Valeo Service is participating in ACMA Automechanika. The last time we participated, we received very good response. Valeo Service is well known for our transmission and electrical products among our customers. So, in Automechanika our main objective is to introduce a range of other products from Valeo’s portfolio such as compressors, lighting solutions, wipers, diaphragm clutches for heavy commercial vehicles. We expect some of our customers to visit Automechanika from neighbouring countries, so we would also be focussing on the trade export opportunities for India made Valeo products at the expo. Are you going to launch any new product at the ACMA Automechanika 2019? During ACMA Automechanika 2019, Valeo will highlight its key product lines, as the fundamentals to address the Indian market, especially electrical systems and transmission systems. What are your growth plans for Valeo Service in India? Valeo has established a strong presence in India and we have been growing phenomenally in the last 4 years. This is mainly due to our strong product portfolio and service. Valeo capitalises on getting closer to closer to its local customers, to better understand their day to day preoccupations, and deliver a service perfectly adapted to their specific needs. This is the perfect embodiment of the ‘We Care For You’ statement. Specifically in India, Valeo is focusing on growing ahead of the market and to achieve this, the company would be focussing on enhancing our product portfolio and bringing in the range revolution. Valeo would be adding new products to our portfolio that are in synergy with our existing product line to provide us with the additional top line growth. To increase its market share, Valeo plans to tie-up with fleet owners to provide them with a one-stop solution and launch new products in the truck segment.